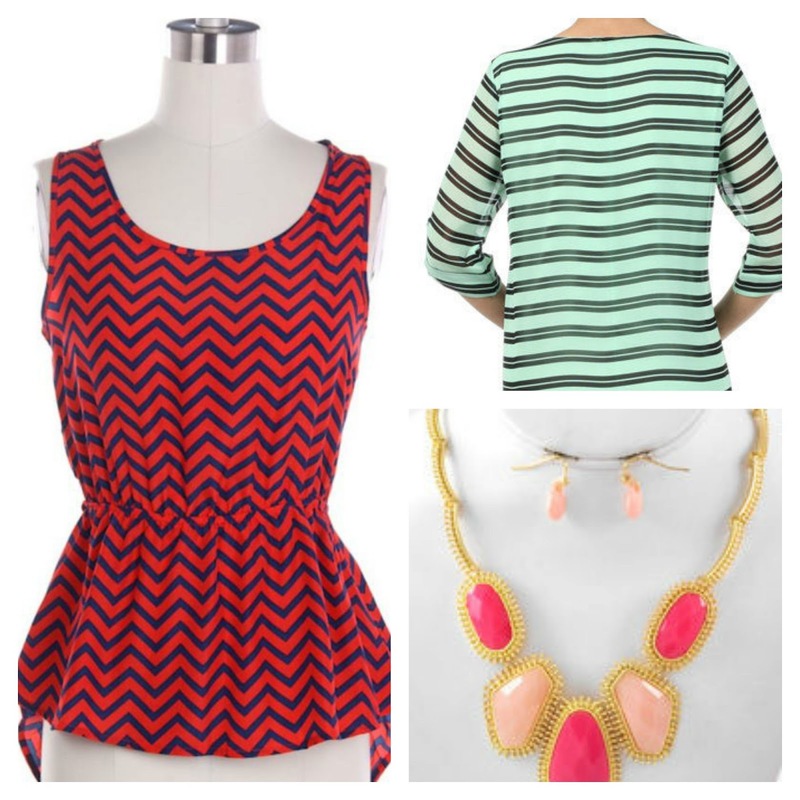 KEEP CALM AND CARRY ON: Friday Fashion Finds! On Tuesday, I told myself it was Wednesday. It does not make the week feel short, I'll tell you that much. It's safe to say I'm happy that it's finally Friday! It IS Friday, right? I've got a hot date tonight with my cowboy boots, my man, and my girlfriends to hear a live country music band play...I'm thrilled. Tomorrow, I plan to work in the yard and then will be celebrating one of my girlfriends birthdays later that evening! It looks like this weekend has a lot of potential...but then again, every weekend does. And is normally really amazing. I've got some fabulous deals to share with you today! 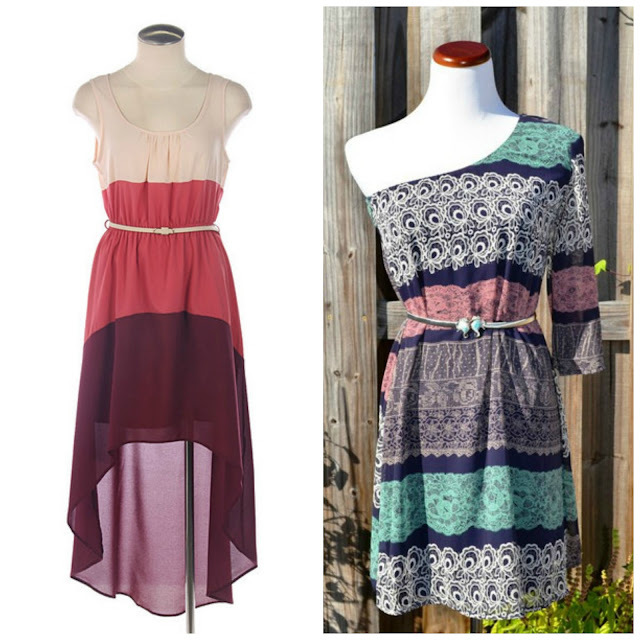 The cutest dresses, accessories, and jewelry at amazing prices. When I say jewelry, I mean they have the popular monogrammed necklaces that you've always wanted but didn't want to shell out one hundred bones. I finally proudly own a gold monogrammed necklace from them and am so impressed with it. Some other looks from them? Do you know how many good deals I just added up mentally with one of those coupons? Get on it! Such a great shop. A boutique started by a friendship between two girls who met in college and shared a love of fashion. One happens to be the lovely Regan who is a blogger herself and a friend of mine. Nothing in their shop is over $50! Don't you love that? I do. 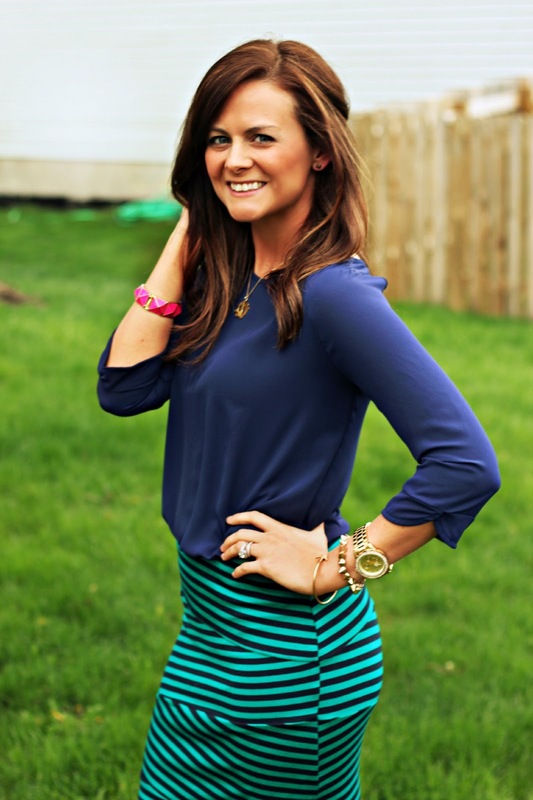 I'm wearing their Navy 3/4 Sleeve Blouse ($28) that is absolutely perfect for spring. It's lightweight and goes with skinny jeans, skirts, or shorts. You can follow Crave Boutique on Instagram (@shopcrave), so you can stay updated on their new arrivals! Well, they just got in skirts. Cute maxi chevron type skirts. Oh, and dresses and tops! They still sell their awesome jewelry, they have just expanded to these as well. They have multiple colors/styles of this..go take a look! Rocky says happy shopping, ladies. love it all!! that last skirt is just so cute! I LOVE/hate when you do these posts! I think with the exception of one time I have visited these online stores and bought a ton of stuff. I just purchased three adorable scarves from Southern Charm apparel and it only cost $35! Thank you so much I cant wait to wear them and that is SUCH a steal! I know of your love for real estate (read: looking at big houses), and my boyfriend and I LOVE to do the same. My parents are buying a house in columbus and i got an email this morning from my mom with the subject "we found it" and i thought for sure it would be their house. I WISH! You need to go over to that house and knock on the door and go inside! If i lived there, I'd stalk it for sure! Katie - I love that one shoulder "Cowboy Charmer" dress! Too cute :) I hope you enjoy the band tonight! Grandview Cafe will be fun! You always show us the best stuff!! That infinity scarf is perfect (it was great until I saw it was only $15 then it became perfect!) Rocky is too cute!! Loving the scarf in this post! And again... if I send you my credit card, can you just purchase a new closet full of fun clothes for me? Or.... even better, take me shopping with you when you come back to TEXAS. I know your besties would love that. hehe happy weekend pretty lady! That Rocky is such a charmer! I love that chevron skirt! 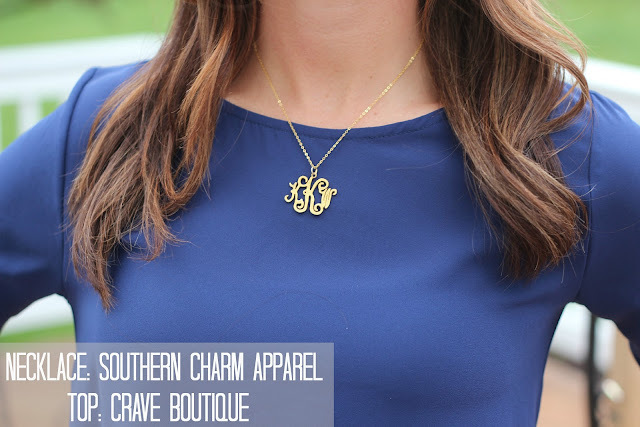 You have made my day posting about the monogram necklace! I've been dying for one, but all of the ones I've found are $100+ too much for this cheap girl! when when I will come back here.